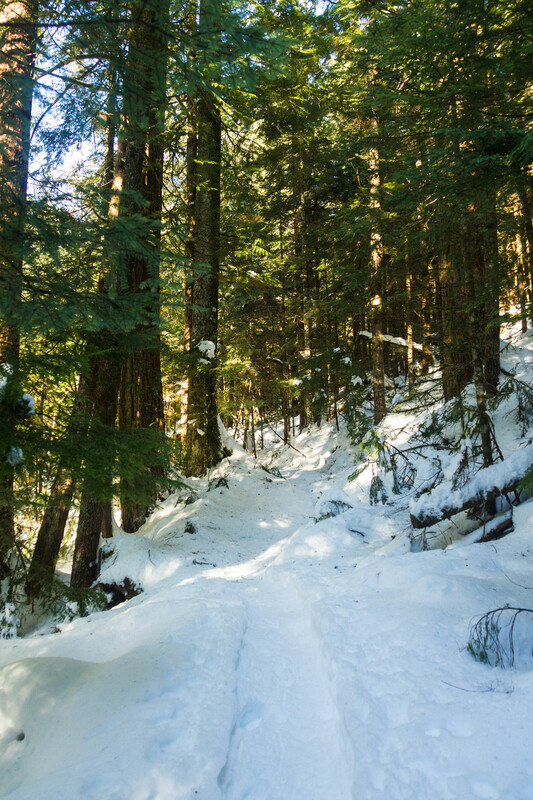 The Marten Creek trail is an unmaintained, often overlooked gem. When Andy and I visited on a Sunday early in January, we nearly had the trail to ourselves. It hadn't snowed in a while, and the snow had a hard, slippery crust that made our snowshoes unnecessary, but we still had a lovely time hiking through the quiet, snow covered woods. The trail starts off steep, then gradually levels out to follow the creek through a small, shady valley. It's the sort of place you can picture brimming with wildlife and flowers in the spring, but for now everything is quiet and still. 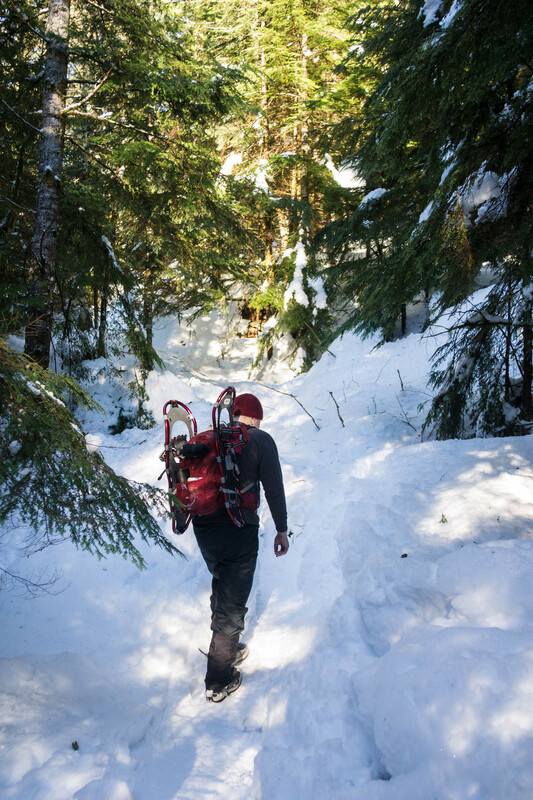 As we started climbing steeply from the trailhead, I found myself fighting for traction on the icy, packed snow. They might not have been necessary for staying on top of the snow, but I happily strapped on my snowshoes for the extra traction. 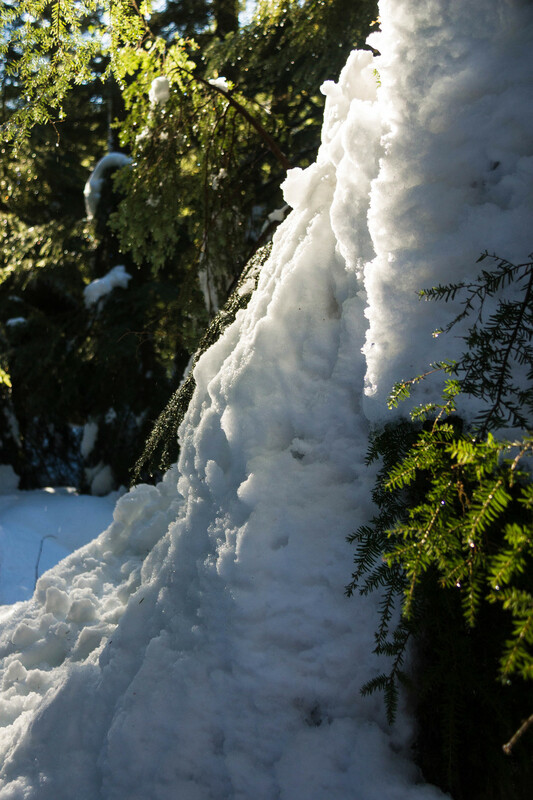 As we climbed away from the trailhead, the snow became a little softer and deeper. Andy, who wasn't wearing snowshoes, postholed up to his waist a few times stepping off the packed trail. Suddenly my snowshoes weren't so unnecessary! 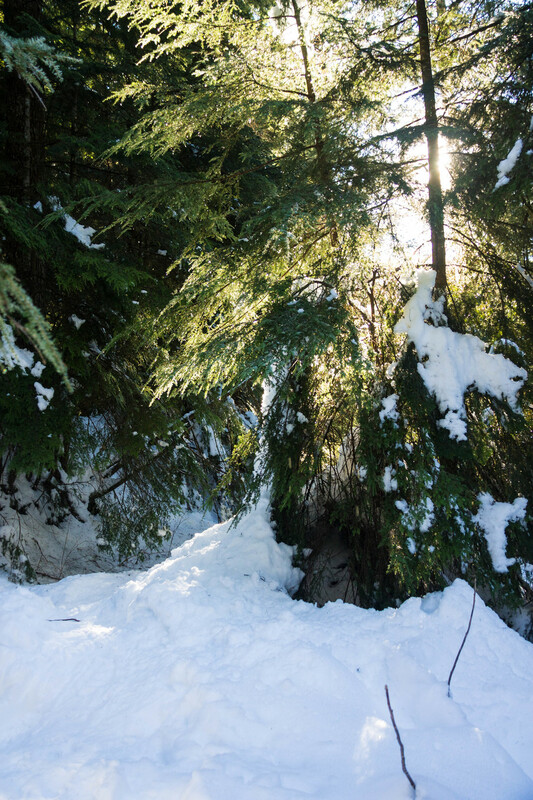 For a while we talked as we hiked, but eventually we just enjoyed the hush of the snowy woods and the warmth of the sunshine filtering through the trees. After a quick lunch of homemade sandwiches and a thermos full of hot chocolate to keep us warm, we headed back to the car, making astonishingly good time. Andy introduced me to the art of foot glissading. I strongly dislike feeling unbalanced, and never slid very far, but there were a few moments when I was laughing out of joy instead of panic. Perhaps with time, I'll get better at allowing myself to slide instead of constantly fighting for traction and panicking when I lose it! 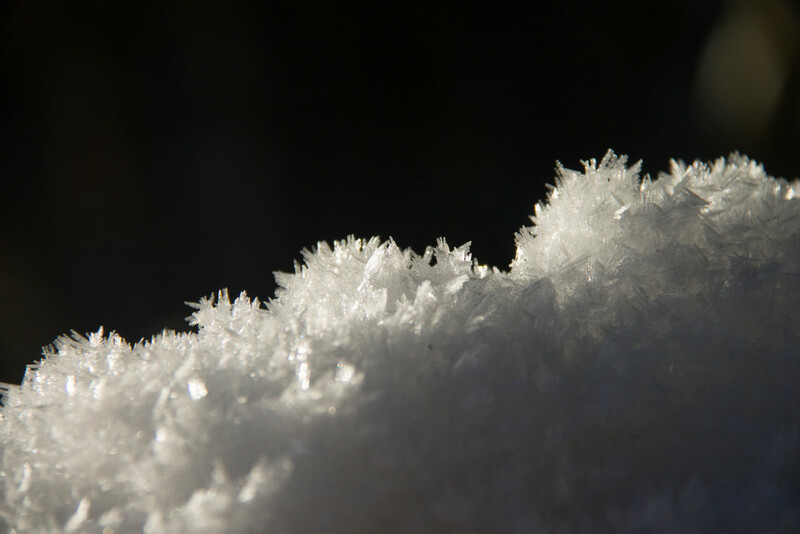 Back at the car, we stopped to snap some close-up photos of the incredible landscapes of frost that covered the snow banks on either side of the road. Touching this frost with a gloved hand was like brushing a frozen nettle. 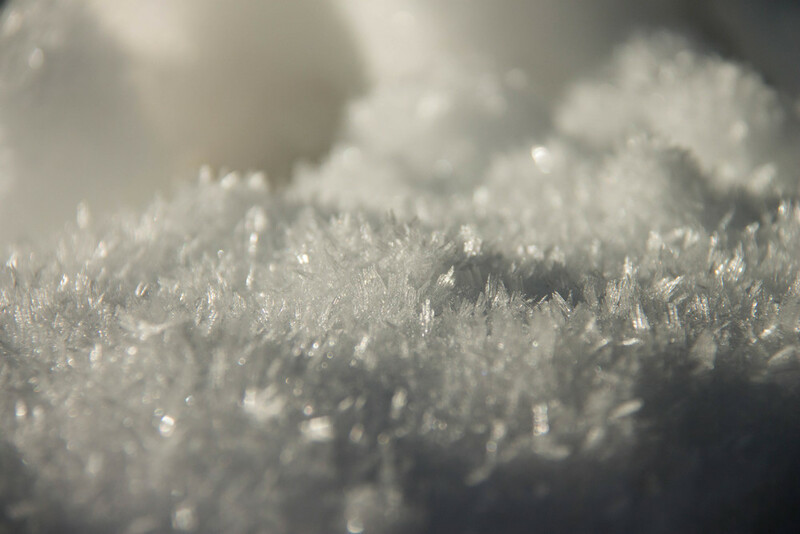 Tiny, brittle spikes of ice stuck to the heat of my glove, then just as quickly melted away. I could have spent hours taking photos of this prickly frozen carpet, but the sun was going down, and we had to get back home for dinner!